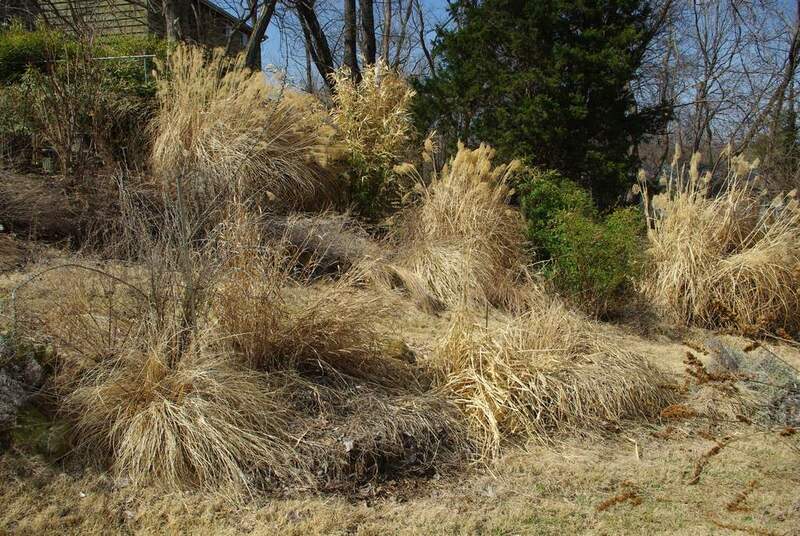 I really hate doing it, but it's time to cut down the ornamental grasses. I put this task off as long as possible each year for a few different reasons. 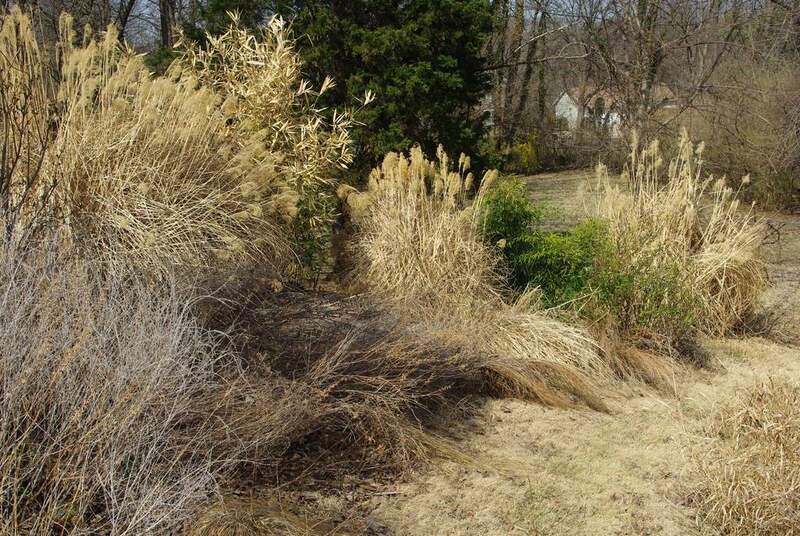 First, I love the look of the large grasses during the winter -- their textures, colors. 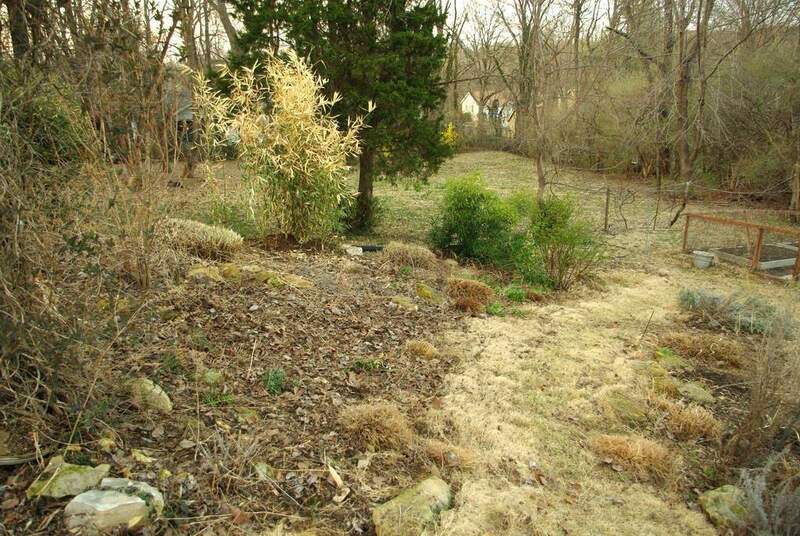 Second, they provide a good deal of privacy for my yard, as well as shelter for birds and other critters. Third, cutting them down is a lot of work. But there comes a time when the new growth is ready to emerge, so the dead parts must go. I did this over the weekend when it was sunny, warm, and dry. Ideally I would have done it on a cooler day because it requires long sleeves and long pants for protection from the sharp grasses, but too warm is better than too cold I guess. Perhaps you might think this is overkill. 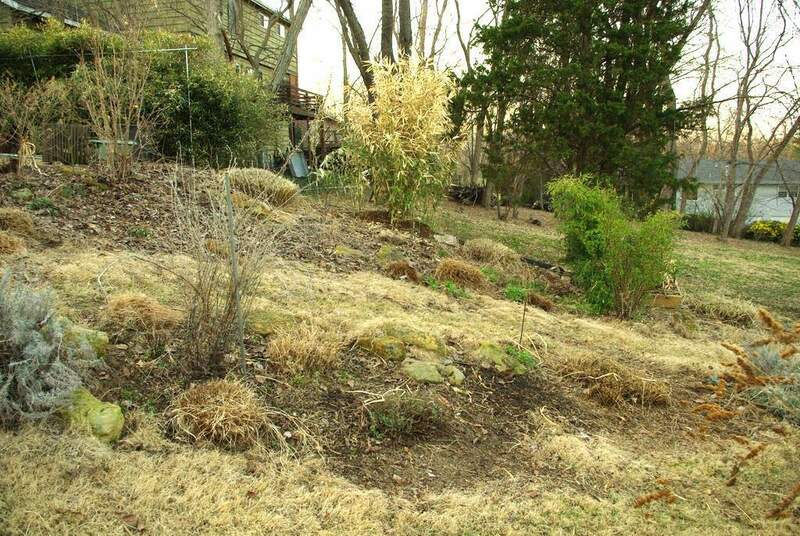 To that I say you cut my grasses down with loppers -- I'll be using the chainsaw from now on! It made the process so much easier. 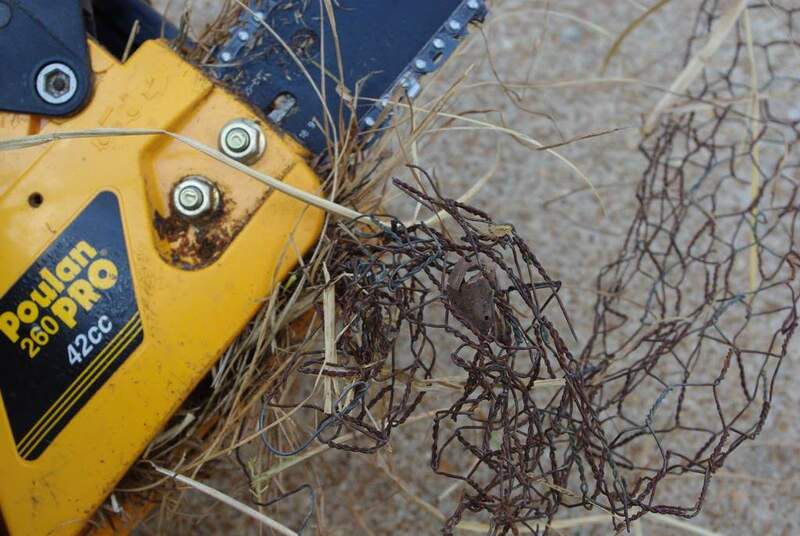 Until I hit a bit of chicken wire and had to loosen the chain to remove it. Other than that little mishap, it was great! 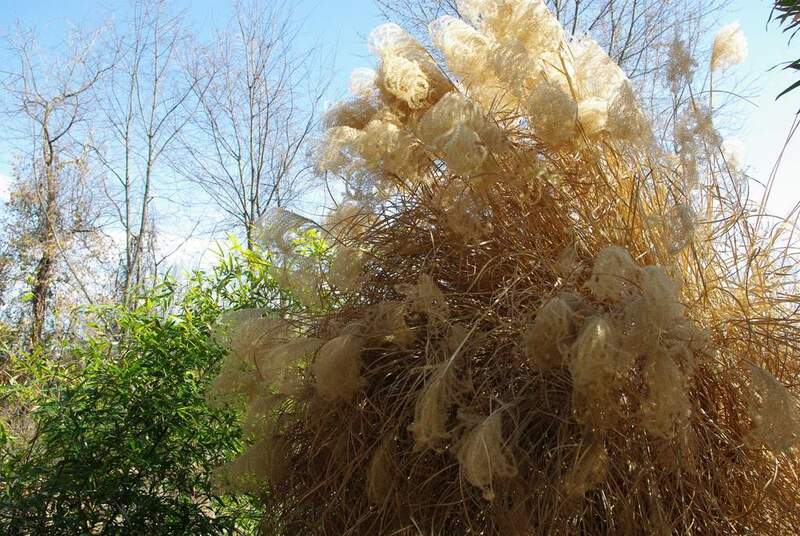 And its curly seed heads are so nice! When I think about it though, I'd rather have the lovely green of the new grass blades, and cutting the old growth down is the only way to achieve that -- so down it goes! With the chainsaw it took me at most 10 minutes to cut all five plants down. With loppers it would have taken me almost that long to do a single plant. 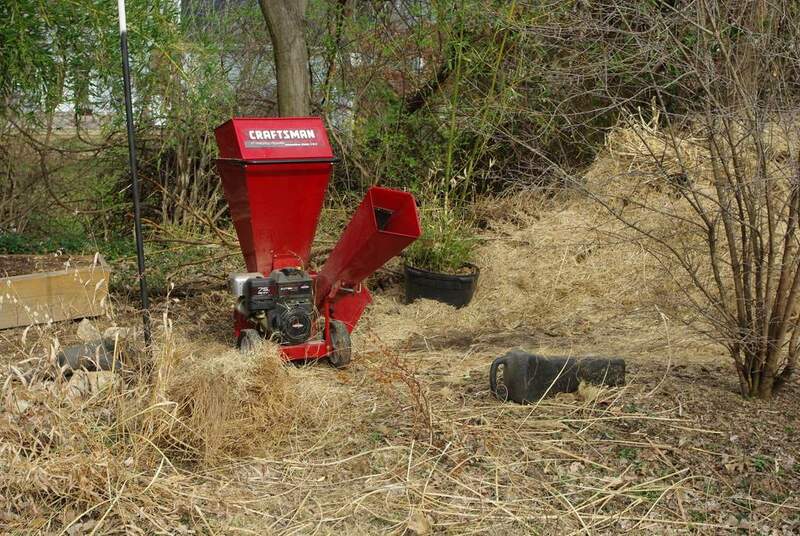 The final thing I did differently was to shred the grass stalks immediately. Usually I pile them up and put them through the chipper another day -- due to the fact that cutting all of them down was a big enough job. The chainsaw saved me so much effort though, I was ready to tackle the chipper too! 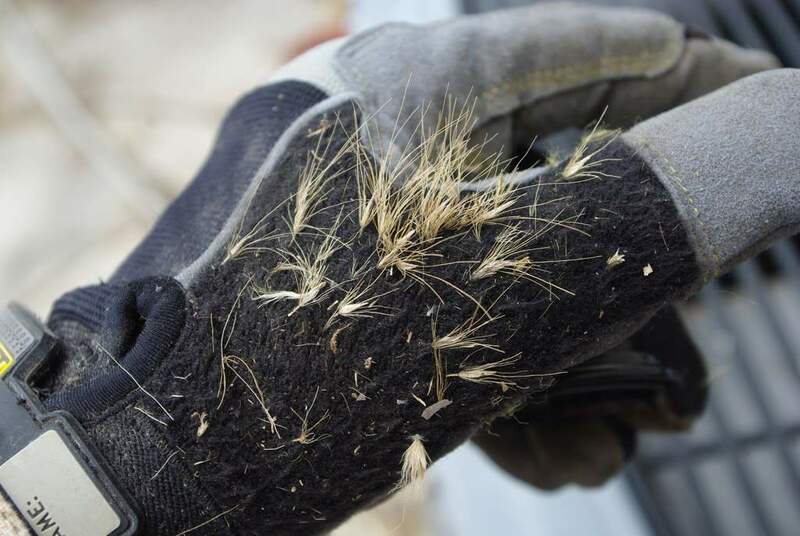 These seeds are embedded in the glove somehow. You can see how much privacy I've lost, but I'll soon get it back once things start growing again. I don't know if I've ever cleaned up so much of my yard in a single day before. It was really a productive day -- or at least 6 hours of a day! Now I can just sit back and relax for the rest of the year, right? 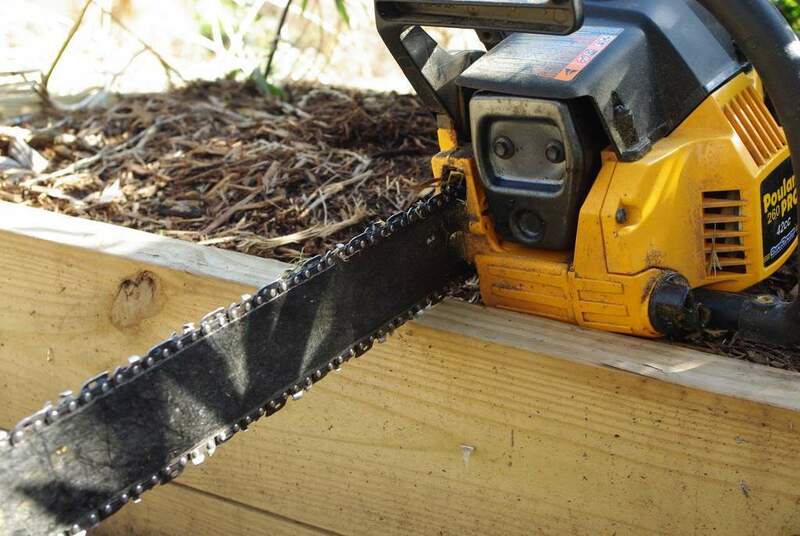 Great use of your chainsaw. It wouldn't have occurred to me to use it. Did you spot any signs of new growth yet? 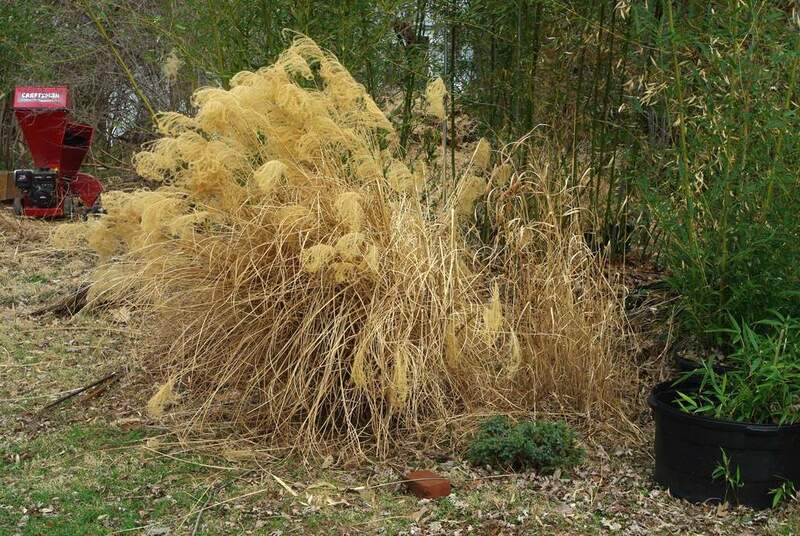 Our miscanthus (miscanthi?) 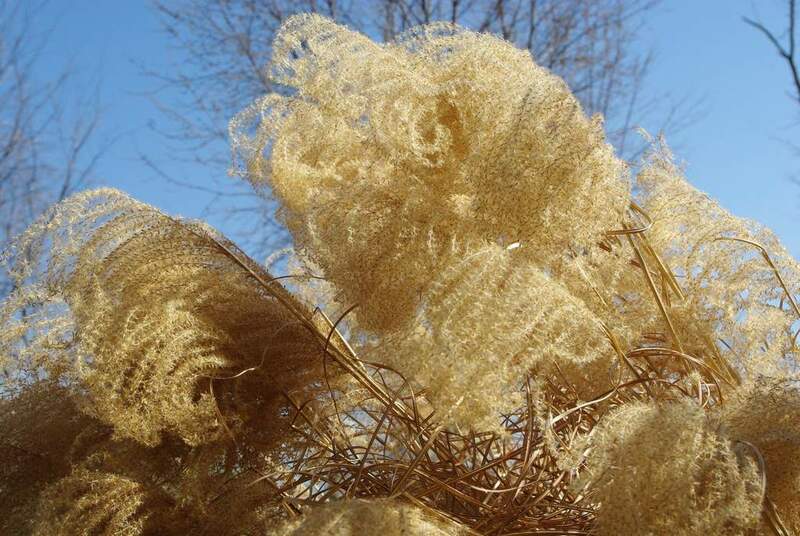 are definitely pushing new growth, as are almost all our ornamental grasses. No signs of new growth, other than a couple of green stalks when they were cut. Some of the smaller pennisetum had some green blades pushing out, and the Hakone grass is greening up, but the big ones nothing yet. 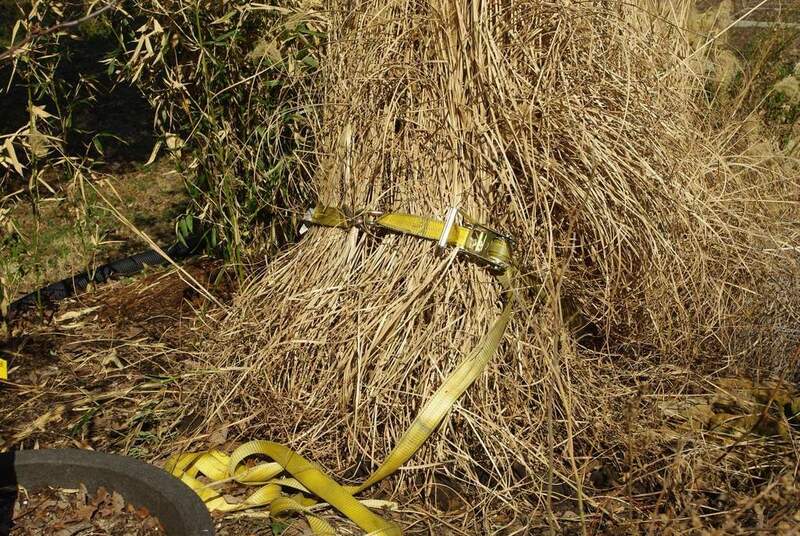 We cut the big grasses down at clients' houses with a saw too but we use a handsaw -it's SO fast! Hi Alan - Thats a lot of work you got through! 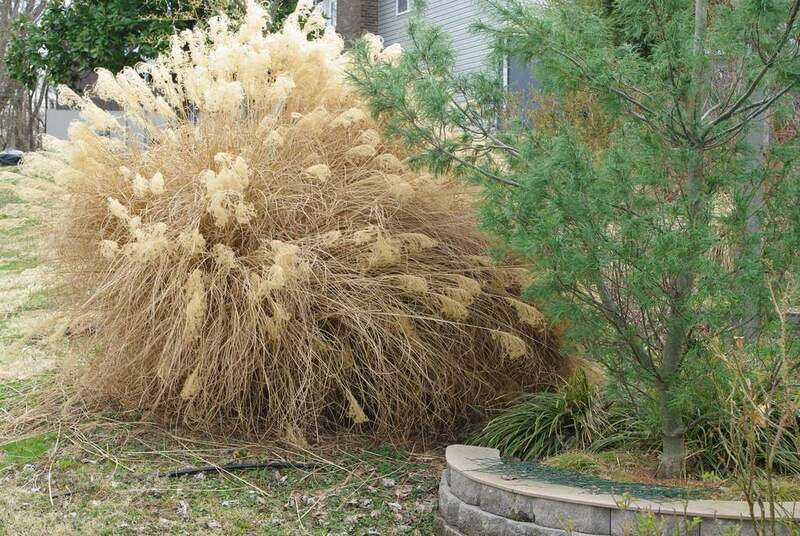 I love your use of grasses. I'm looking for ward to seeing them all green and gorgeous again soon - how long does it take before they are as you want them? Hey, YOU are the guy with 80+ degree weather :-). 40F is still a lot better than 15F-27F for the next couple days. Anyways that chipper looks pretty useful for these kinds of jobs. 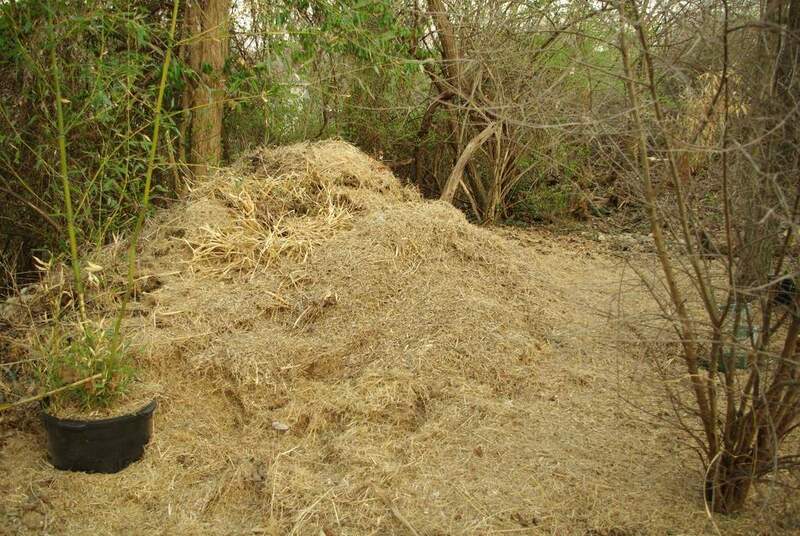 You could probably take stuff from around the neighborhood to create mulch or bedding for the garden/ other plants for free. Steve: The chipper is quite useful, but I already have a job. ;-) I'd rather just pick up a couple of loads of "junk" mulch from the community mulch pile when it's available. Can't say I'd ever have thought of using a chainsaw. But your grass clean-up looks great, and I'm sure they'll be back and green in no time.